We've discussed before the international and domestic legal regimes governing the crime of piracy and the capture of Abduwali Abdukhadir Muse (left), presumed to be a Somali pirate involved in the attack against the Maersk Alabama (below right) back in April 2009. A weapons enhancement statute, 18 U.S.C. 824. He's also convicted of engaging in a conspiracy to commit same. Pursuant to 18 U.S.C. 3238, the U.S. will prosecute Muse in the Southern District of New York, which was the jurisdiction to which he was first brought after allegedly committing his crimes on the high seas. The 10-count indictment is discussed here. The third offense traces its origins to the 1988 Convention on the Suppression of Unlawful Acts Against the Safety of Maritime Navigation (SUA), promulgated in the wake of the 1985 Achille Lauro attack (ship at left) undertaken by alleged Palestinian Liberation Front members who hijacked the ship to protest the incarceration of a group of Palestinians by Israel. In the course of the incident, a disabled Jewish tourist (Leon Klinghoffer) was brutally killed. (In a subsequent lawsuit, the cruise-line defendants impleaded the Palestinian Liberation Organization, which eventually settled the case after losing a motion to dismiss on foreign sovereign immunity and personal jurisdiction grounds. Klinghoffer v. S.N.C. Achille Lauro Ed Altri-Gestione, etc., 937 F.2d 44 (2d Cir. 1991)). 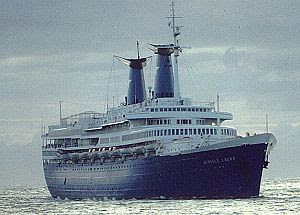 The Achille Lauro attack, while called "piratical," fell outside the technical definition of piracy, because the attackers were passengers on board the ship (thus failing to two-vessel requirement of piracy) and they acted for political, rather than private, ends. The victim ship must be in international transit to trigger SUA (Art. 4). Although many terrorism crimes are defined in terms of some surplus of intent or motive (usually to intimidate a civilian population or influence a government), neither of these two crimes contains such a requirement beyond the hijacking statute's vague compulsion element. 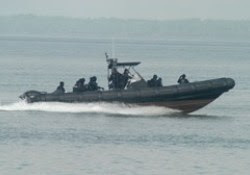 These terrorism crimes thus fill several of the gaps in the conventional definition of piracy, which requires two vessels (some commentators suggest that an attack by a skiff (right) doesn't count), the attack must occur on the the high seas or in a state's exclusive economic zone, and the attack must be for private ends. This point is emphasized in a recent case out of the 9th Circuit. In Lei Shi v. U.S., 525 F. 3d 709 (9th Cir. 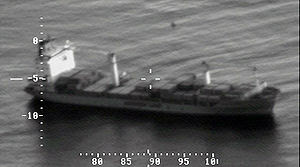 2008), the defendant was prosecuted under section 2280 after he mutinied and took control of the ship in international waters off the coast of Hawaii. Lei Shi argued that the statute was unconstitutional as applied to him. The court ruled that the U.S. Constitution at §8, cl. 10 empowers Congress to define and punish piracies and felonies on the high seas and that §2280(a)(1)(A)-(B) defines an offense that meets the definition of piracy. Id. at 721. The defendant also claimed that there was an insufficient nexus between his acts and the United States, thus offending the 5th Amendment due process clause. The court ruled that due process requires a nexus only when international law requires such a nexus. The crime of piracy, it noted, first gave rise to the concept of universal jurisdiction and defendant was thus on notice that he could be prosecuted for his crimes in any nation-state in which he could be found. Id. at 724. Muse has pled not guilty and will be tried as an adult, although his age is contested. Stay tuned!